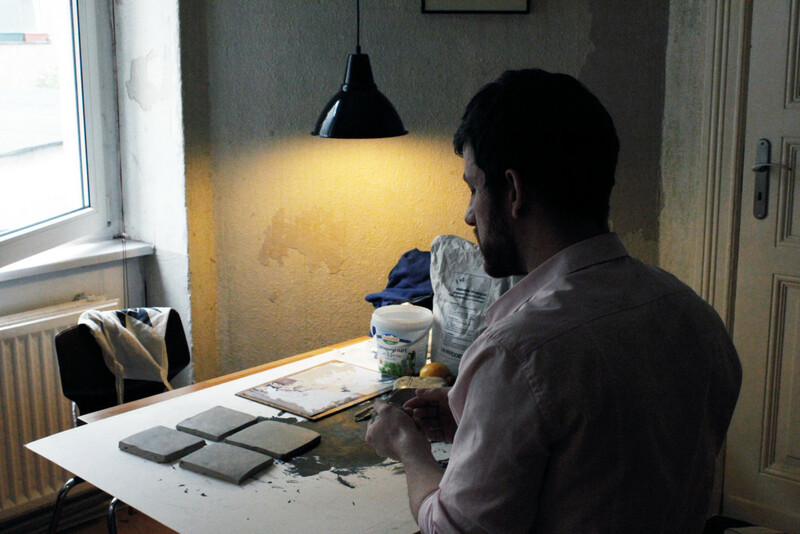 I asked Hannes Uhlenhaut, a sculptor from Leipzig, to teach me something that I could pass on to another person, for me to figure out how to organize my project. So, first we chose some random item available. 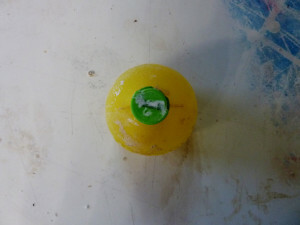 I liked the idea of using the lemon juice plastic bottle. 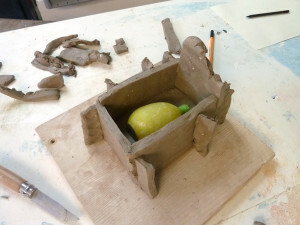 For I had been thinking about casting a bowl of plaster-lemons before. 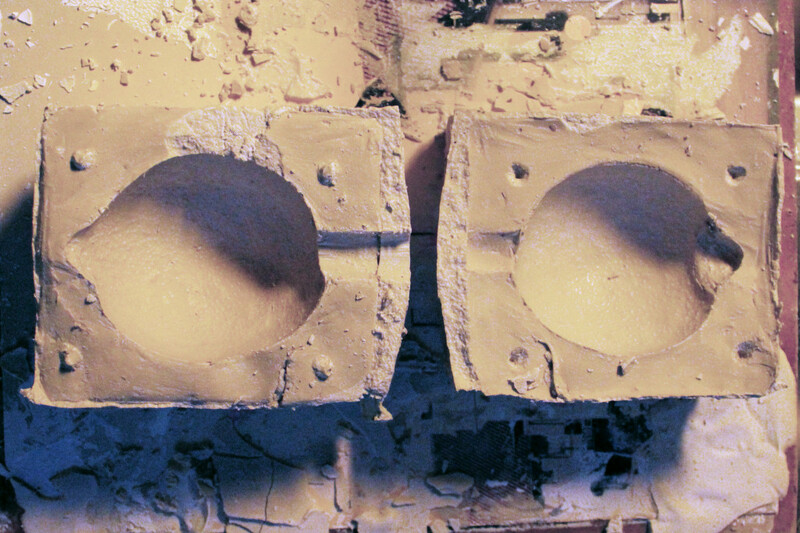 We filled up cracks and parts with clay, that could be a problem when removing the plaster. The more closed the object is, the easier to make a good, re-usable form. Next we made a little even “bed” for the lemon-bottle and leveled out the tiny gaps. 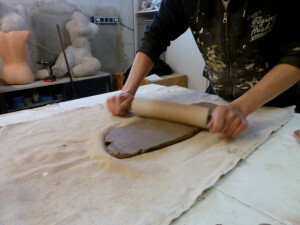 To create even walls, Hannes rolled out the clay after kneading it for a while. 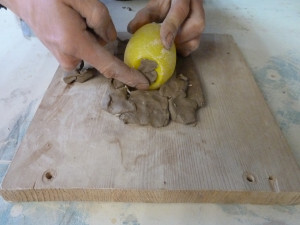 We cut four square pieces, built them up around the lemon and its bed and stabilized them with clay-collumns. 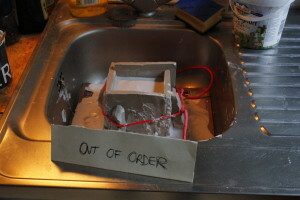 Plaster is a drifting material and can develop strong forces. It’s important to make a stable form, otherwise you’d flood the table. Luckily it worked out. 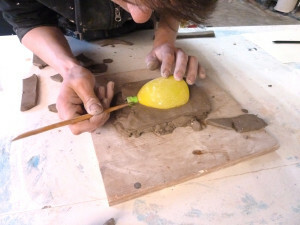 We filled in the liquid plaster and after half an hour we could remove the clay and clean the other half of the lemon. At that point it was time to go, so we never finished that piece. But I took the things, I had learned, with me to Berlin, where I would meet Jon Campbell. 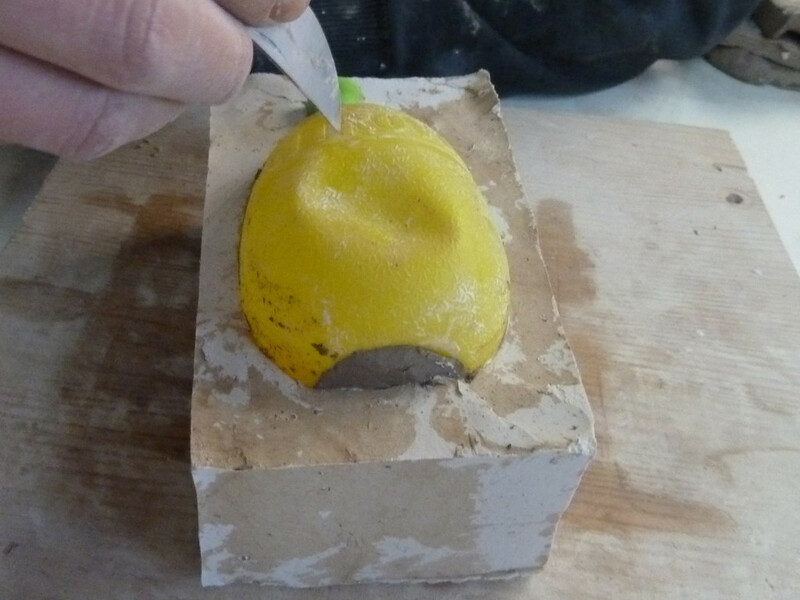 To complete this experiment I bought a lemon me and Jon would make a mold of. Time to werk! 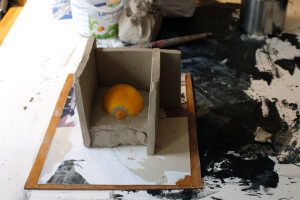 In the manner of how Hannes had told me before, we prepared the lemon, covered it to the half with clay and filled up dangerous gaps and cracks. 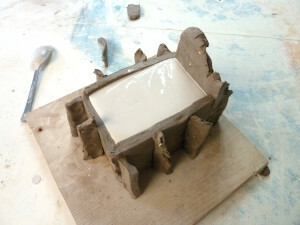 Placed into its little clay castle we moved on to mixing the plaster. 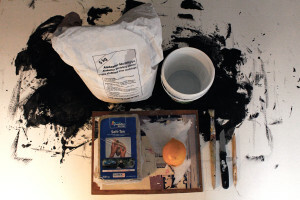 Carefully we shoveled a handful of dry plaster into a more or less flexible plastic pot filled with water. We waited until the powder disappeared underneath the shore, before we put in more. We did this for a while until the plaster stopped sinking and stayed on the surface like the top of on iceberg. Then we waited for some minutes and carefully stirred it until the water mingled with the plaster and became one creamy, but liquid mass. 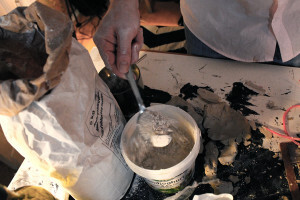 While pouring it into the form, the clay broke and we had to stabilize it with both of our hands for some minutes. We figured that the clay was too wet. Anyway it kind of worked and we repeated the process one hour later with the other half. To avoid that the plaster would link with the existing form, we put some “slip” on it. That’s how you call clay with water. Also we carved in some holes “locks” into the form, so later the two parts would perfectly match. After all of that was done, we finally filled in the plaster that would transform into the actual lemon in the end.